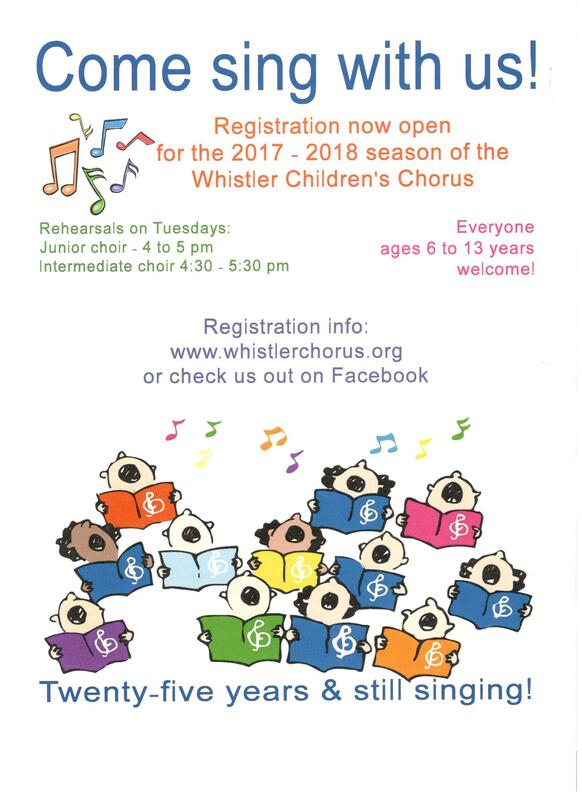 Planning is well underway for the upcoming Whistler Children’s Chorus year of singing. Three formal concerts have been booked. On October 30th the choir will present This is Halloween – a fall concert complete with costumes, props and songs. The choir will host their annual Christmas concert to benefit the Whistler Food Bank on December 11th. Christmas Tales will be a combination of songs and storytelling focusing on winter and Christmas. 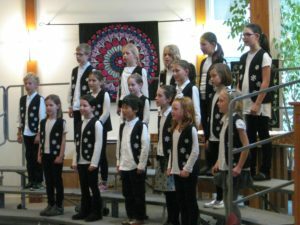 Shortly after Earth Day in April 2017, the choir will present their annual spring concert – Honour the Earth. 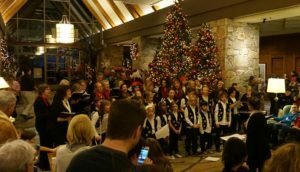 Of course, there’s lots more singing for International Day of Peace, Remembrance Day, Bizarre Bazaar, Santa’s arrival at the Chateau Whistler and the Christmas Eve Carol Service. 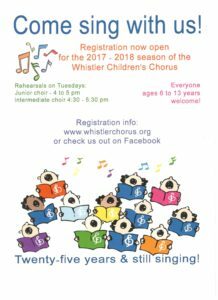 As well, we’ll return in the spring to the Howe Sound Music Festival and hope to take part in the Vancouver Kiwanis Choral Festival. The children’s choir finished up a year filled with singing, dancing and fun with their concert on Sunday, May 1st at the Catholic church. Beginning in September with the UN International Day of Peace, the choir had a busy fall They presented Annie the musical (with only 7 weeks of rehearsals! ), sang for the municipal Remembrance Day ceremony as well as several Christmas gigs including the annual Christmas Eve Carol Service. The choir traveled to Squamish to take part in the Howe Sound Music festival in the spring which was a great experience for all. A lot of repertoire was explored this year from unison to 3 part harmonies. The singers were up to the challenge and sang beautifully. 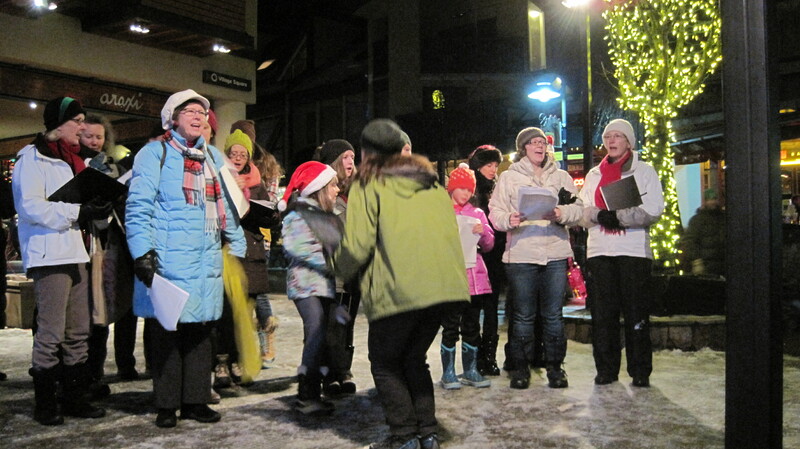 Thank you to everyone who came out this evening to share the holiday spirit with members of the Whistler Children’s Chorus, Whistler Singers, Whistler Community Band, Our Lady of the Mountains Catholic Church, and Whistler Waldorf School as we caroled through Whistler Village and then held a Holiday Sing-Along at Millennium Place. A big thank you to the Whistler Arts Council and staff who provided the venue and made this event possible. 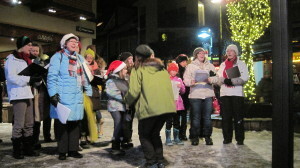 Members of the Whistler Children’s Chorus, Whistler Singers, Our Lady of the Mountain Church, and Whistler Waldorf School carol in Village Square.